Locally crafted Honeycandles bring the warm amber glow and purifying effect of pure beeswax into your home. 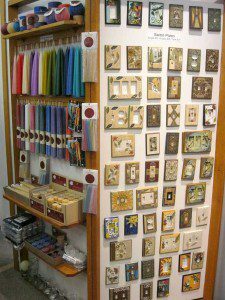 Tapers, votives, tea lights, pillars, gala candles, and more in natural colours, or coloured with Enviro Dye… and after the table is dressed up, decorate your walls with these quality ceramic switch plate covers by All Fired Up. William Morris once suggested that one must “Have nothing in your house that you do no know to be useful, or believe to be beautiful.” All Fired Up’s products truly are both.